In the bowl of a stand-up mixer, using the paddle attachment, beat the butter and sugars together until the mixture turns a light brown color, about 2 to 3 minutes. Crack in the eggs and beat once more until the eggs are fully incorporated. In 2 batches, add the flour mixture, beating just until the flour is fully incorporated. Pour in the chocolate chips, coconut flakes and pecans and mix once more for a few seconds. 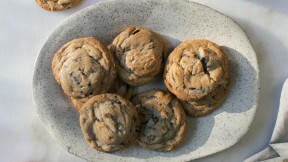 You can bake these right away, though I love letting them rest in the fridge overnight. When you're ready to bake, preheat the oven to 350 degrees F. Line 2 baking sheets with parchment. Using a tablespoon measure, scoop out balls of dough and roll them with your palms. Place them about 3-inches apart on the baking sheets. Bake one sheet at a time for 10 to 12 minutes or until the edges are lightly golden brown. Let the cookies cool on the baking sheets for 5 minutes. Transfer the cookies to a wire rack and let them cool to room temperature before serving (or eat them warm--live!). Repeat with the remaining dough.